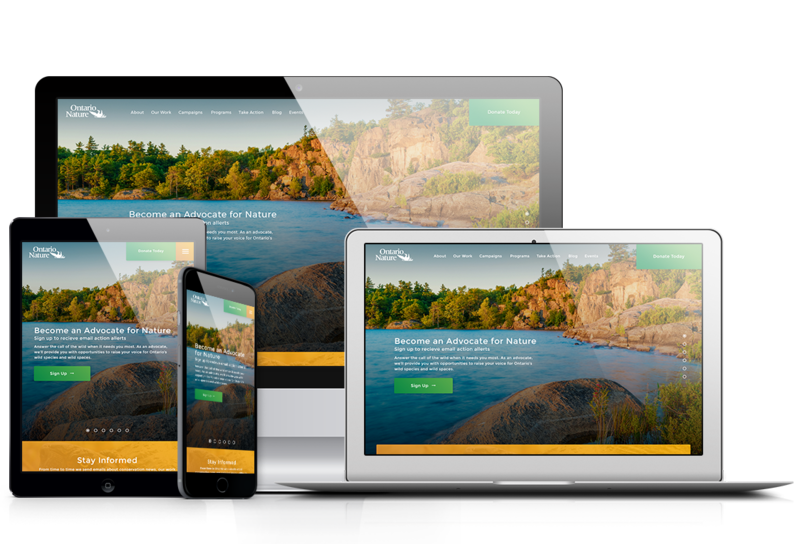 Below we have outlined many of the little details and all the thought that went in to your landing page design. 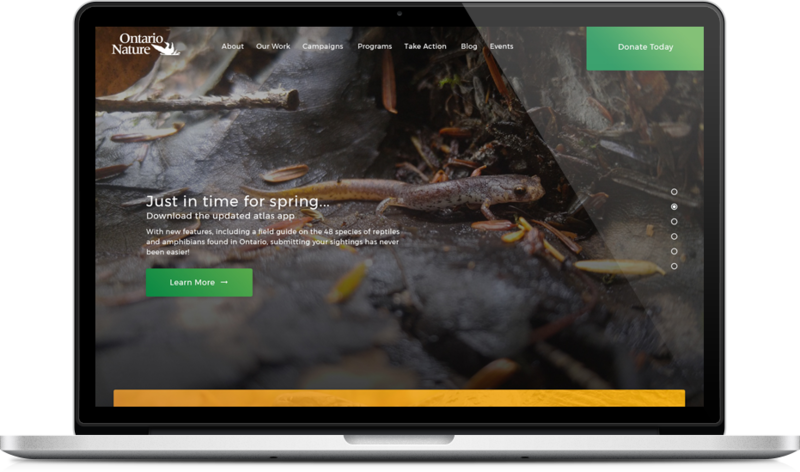 Our goal with this design was to create a user interface that is not only contemporary and professional, but also easy to navigate and explore. 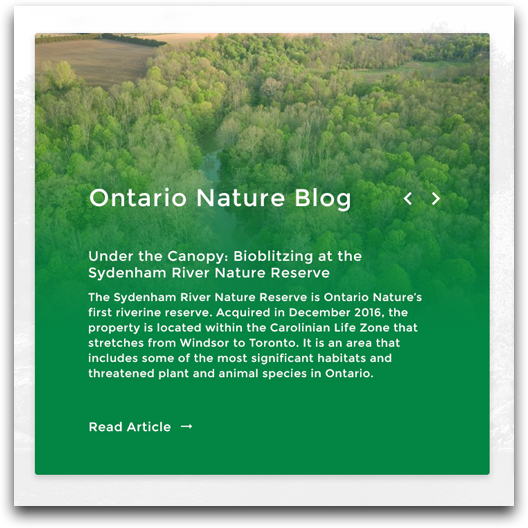 Instead of using dull bulleted lists and blobs of text to communicate Ontario Nature's message, our designer has created a dynamic layout that feels uncluttered while also providing an informational resource for their clients. 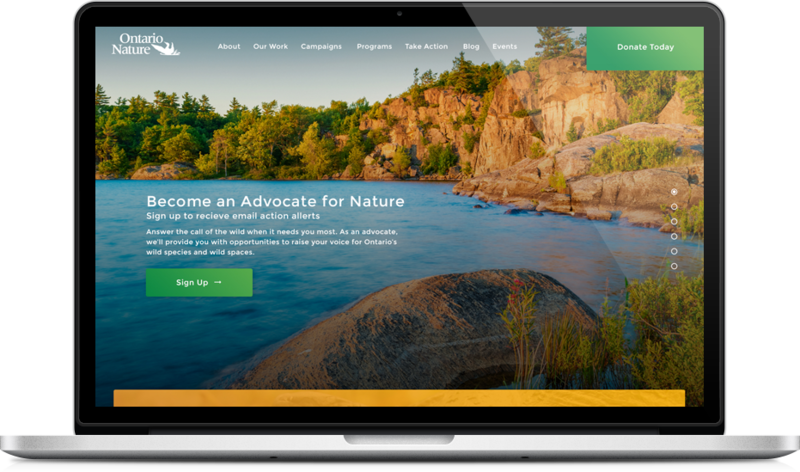 For this mock up we opted for a colour scheme utilizing Ontario Nature's branding colours. However, colour is very flexible as it can very drastically change the mood of a design, so we advise to consider it. We have selected a grounded and simple sans-serif typeface for all the type on the design for a terse look. This font is web safe and will render correctly across all browsers and platforms. 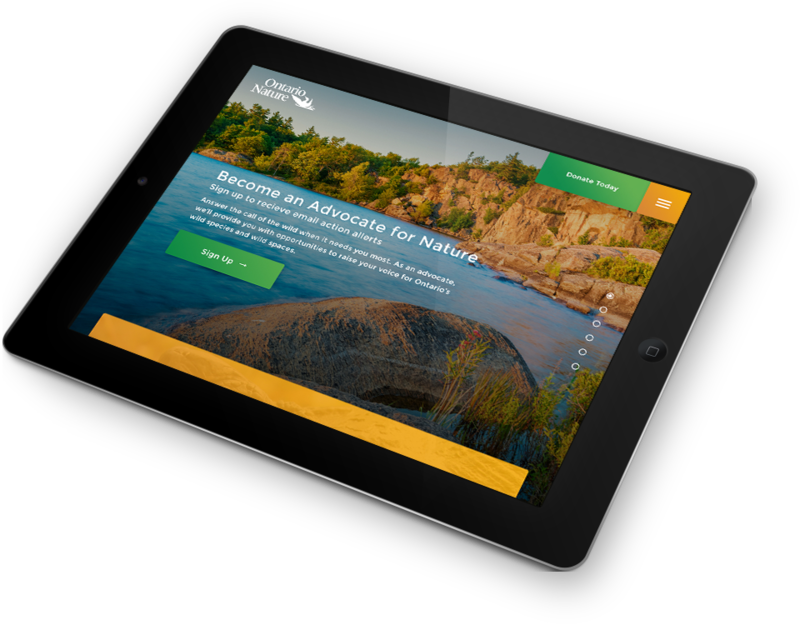 A responsive design allows Ontario Nature's interface to be more accessible to their visitors. The design stretches and forms itself to every screen size, so that every user gets the best possible experience. 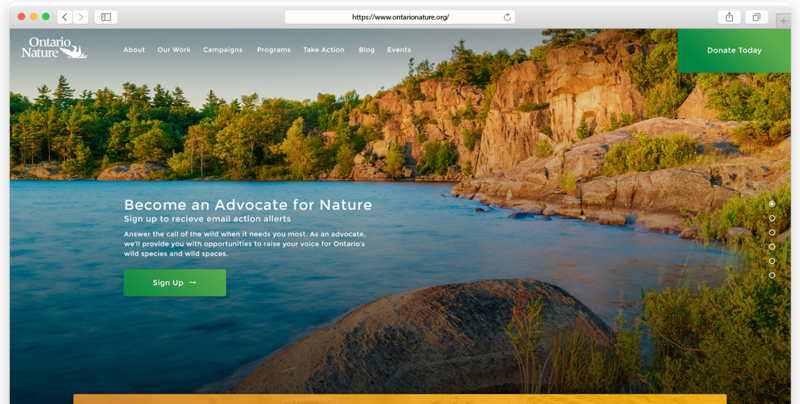 The Desktop version of the design is optimized for viewing on a laptop or a monitor. Every element of the design will become larger and more spread out or smaller and closer together depending on the specific size of the screen. 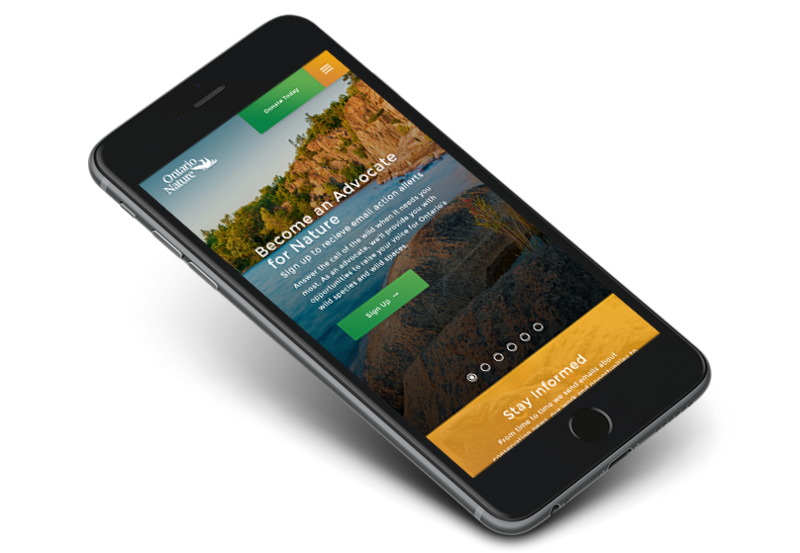 jQuery is the perfect way to communicate the services available to Ontario Nature's clientele, while adding subtle movement to the design. 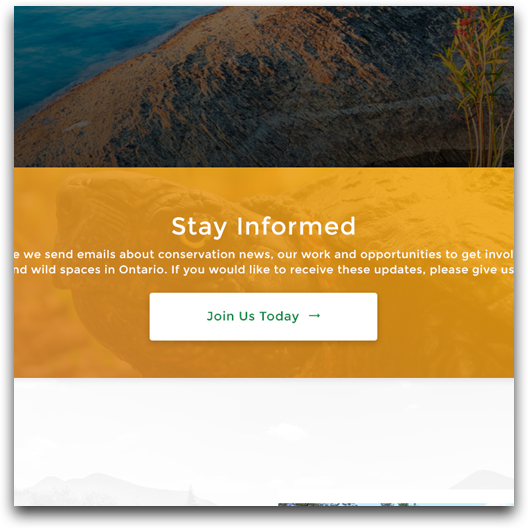 A subtle newsletter form is just under the fold of the design prompting the user to take action. The form opens in a modal as to not take away from any aspect of the design. A news panel (and subsequently events panel) on the site helps users stay up to date with your latest works. One of the most important functions of the home page is to direct the user where to go. This is why much of this design is dedicated to this purpose. 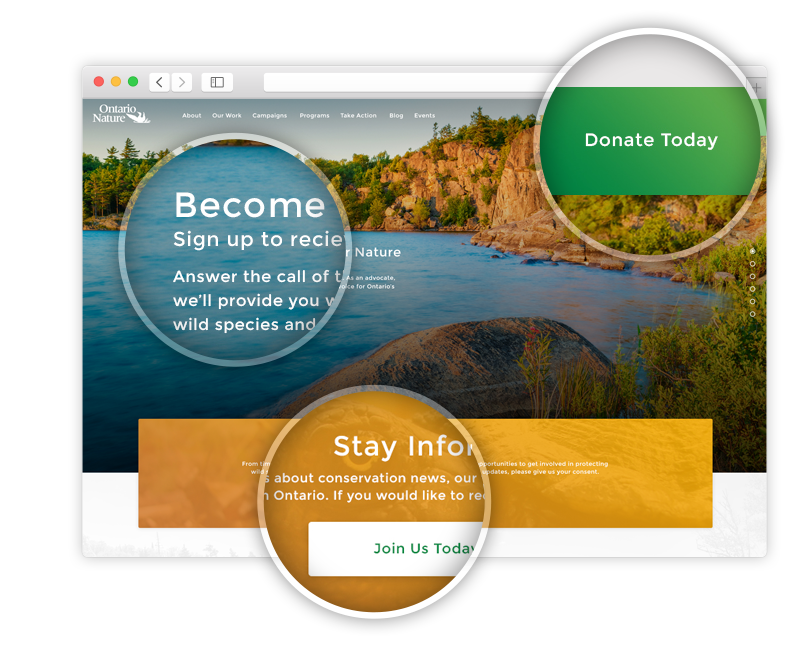 Actionable Items in the form of content boxes, a contact form and the jQuery rotator help to inform the user and entice them to explore the site further to create conversions. The tablet version of the design is similar to the desktop version, except that all the graphics get condensed to fit much better at the smaller resolution. 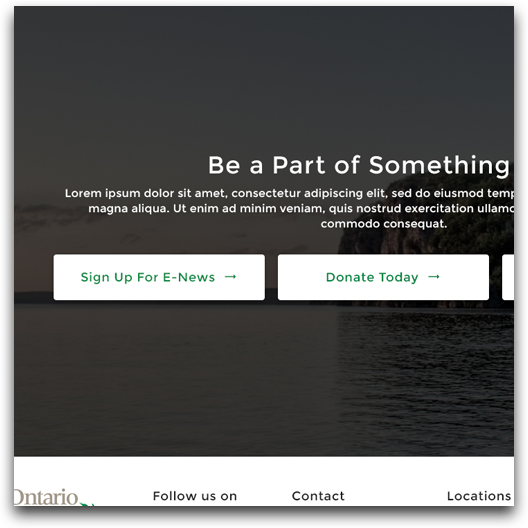 For mobile devices, all the content moves in to a one column layout so that all the images and text can remain large enough to be seen on a much smaller screen. 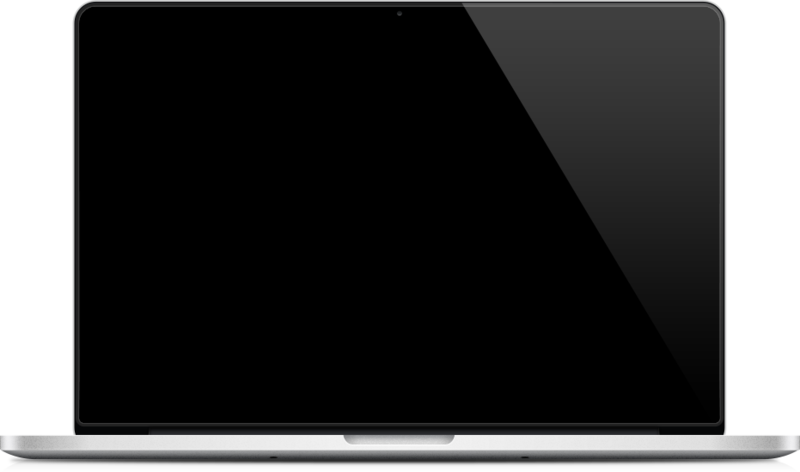 Also many functionalities have been simplified for a touch interface, such as the main navigation.